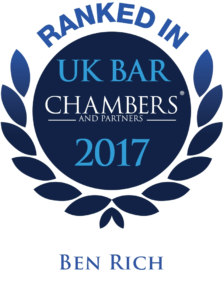 Ben Rich is ranked as an up-and-coming individual in the Professional Discipline field by Chambers UK 2017. Ben came to Chambers in September 2010 and was invited to become a member in April 2012, following the successful completion of his pupillage. He now appears in the Court of Appeal, High Court, Crown Court and Magistrates’ Courts. He also practises in Professional Discipline, Health and Safety and inquests. Before being called to the Bar, Ben had a substantial career as a radio and television journalist at the BBC. He worked for six years as an editor on BBC2’s Newsnight, and ended up as Deputy Editor of the Six and Ten O’clock News on BBC1. In 2003 he won two awards for ‘Blair on Iraq: A Newsnight Special’: a one hour programme on BBC2 in which the then Prime Minister faced an audience opposed to the conflict shortly before the fighting began. Ben accepts Direct Access instructions.